If self-determination is one of the secrets behind the mystery of why mediation works so well, I think we need to fully embrace it. The recent articles by Stephen K. Erickson, Carol Berz and Larry Gaughan highlight a hidden tension in our field—when does our belief in self-determination fall in favor of other considerations. The tension involves the conflict of two great ideas: The first is that we believe that our clients are entitled to determine their destiny, no matter how unusual their decision looks to us; the second is that mediation is a distinct profession and we should not allow coercive legal practices or psychotherapy to “seep into” the mediation room. My background is 40 years of legal practice with 25 years of mediating. Those 25 years include hundreds of hours of talk with my partners and good friends, Ken Neumann and the late Howard Yahm, two incredible mediators and psychotherapists. This personal history has made me see that there is nothing pure about any process to end a marriage. Elsewhere, judges don’t just judge—they often facilitate resolution. Psychotherapists don’t just listen and interpret, sometimes they judge. Lawyers don’t just argue for their client, they often urge their client to see their ex’s point of view. And mediators do it all. I have also seen enormous change in how courts handle divorce cases, as I hear more and more judges voicing clear understanding and direction of how to avoid the worst results for children. Voluntary and mandatory mediation programs are now fairly common adjuncts in the courts. 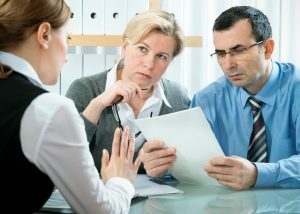 At the same time, the growth of Collaborative Divorce is primarily the result of divorce lawyers working for a better process than litigation. As a divorce lawyer, collaborative lawyer, and divorce mediator, I come down in favor of only one “pure” point: self-determination should approach 100% to the degree as humanly possible. That means it is up to each couple to decide what they want from me as a mediator. Some people just need a good listener while they work out the details, and my role for them is primarily to provide an organized agenda. Some people repeatedly ask for options: “What do other people do?” or “What would happen in court?” I can usually come up with three options from previous cases. Mostly, that’s enough to avoid being too suggestive. In developing Standards of Practice, the question about predicting court results seems to be a bit controversial. In their response to Gaughn’s article, Erickson and Berz clearly state that mediators should refrain from advising about the current state of the law. For them, there must be a clear “line in the sand, no more co-mingling of roles.” To their credit, they honestly state that the reason for this hardline position is the “colonization” of mediation by lawyers. I see this as a somewhat odd notion when presented by mediators who know that a big part of our work is identifying our clients’ fears and dealing with those fears openly and honestly. My problem is that I just don’t understand what this fear of colonization is all about. At present, very few divorce mediators start their professional careers as mediators. The vast majority of us come from either legal or mental health practices, with a smattering of accountants, financial planners and others. While it seems that attorneys dominate divorce mediation in two states, I’m not sure who is colonizing whom, and who is infusing what. I don’t think the answer is all that important, because I believe that professional mediators need a vast array of knowledge to effectively help divorcing couples. It is not enough to understand mediation process techniques. The average couple also wants information about incredibly varied subjects such as budgeting, parenting, mortgage refinancing, grounds for divorce, and on and on. The result is that we use everything in our personal goodie bag, including all of our years of experience as a human being, along with the wisdom that a few gray hairs have wrought, the acumen we bring from our current and past professions and on-going training and education in the realms of divorce and family mediation. So, that’s the next point: I am willing to offer what the clients ask for. If they do not ask about the best way to tell their children about divorce, I don’t offer the brilliant structure of handling that the way Ken Neumann framed it (Visit divorcemediation.com). If they don’t ask about the law dealing with property division or child support, I don’t offer that information. But, just as clearly, mediators must be free to answer these questions with their honest and accurate understanding of the legal landscape (Of course, it is just as important to be able to say “I don’t know.”). A prohibition against predicting outcomes in court would stop me from telling my clients simple truths, such as that a court would divide marital property or grant a divorce without any fault. I can see no value in forcing our clients to consult with others to get simple answers to simple questions. The nuance of the problem and the reason for real tension between competing principles is that predicting the outcome of more complex issues can impinge on self-determination. For example, how much a small business is worth and how much the other spouse would receive are not simple and can never be accurately predicted. When the questions are about something that difficult, it is easy to explain why I can’t answer. In the middle are questions requiring substantive knowledge of the law and the mediation process. Who would get to stay in the present home is one of those middling questions. I believe that good mediation practice sometimes involves ducking the question and instead turning it back on the clients. But, some clients are much more insistent, and again, sending them elsewhere would serve no good purpose. My second concern is whether self-determination should override the concerns that “adjudicatory procedures” (such as predicting court outcomes) are infecting the mediation process, or that lawyers are colonizing mediation. If we truly accept self-determination, we will trust our clients (and ourselves as professional mediators) to answer all the questions about legal issues without losing our balance1 and heartfelt concern for both parties. The draft rules also would prohibit mediators from taking on the role of arbitrator or any other dispute resolution role with the same couple. In essence, this means that we do not trust self-determination to include a choice of allowing a mediator to decide a particular point that the couple can’t resolve on their own. As Larry Gaughan aptly pointed out, a key goal for many couples is “just getting the case settled.” If they have come to trust one of us enough to decide the point, why do we think someone in black robes will do the job any better? And why would we force them to spend the time and money to get the answer from a system that is already overwhelmed and under budgeted? Even worse is that some questions simply have no legal answer at all. In mediation, couples often trade-off pre-tax and post-tax assets. They usually want to take into account future tax consequences. No judge will attempt to decide that issue because it is much too speculative. But, some clients have authorized their mediator to make this decision—just because an exact answer is less important than getting finished. To further the end of keeping the mediation process pure, the draft standards would prohibit mediators from advertising that he/she is also an attorney or a therapist. The actual result would be that the couple might not know about my other expertise until they get to my office. Then, they will see my law school degree and bar admission certificate and perhaps figure out that I do something besides mediate. But, aside from the obvious futility of this rule, I dislike the roadblock it places against self-determination. I get lots of inquiring phone calls that do not turn into clients. Often enough, I learn that they chose to mediate with a different local mediator who is also a therapist. Clients often perceive a particular benefit from working with a mediator who is also an attorney or a mediator who is also a therapist or a financial planner or an accountant or a retired judge, and sometimes just a mediator. I don’t think we have the knowledge to say they are wrong in making their decisions on those bases. APFM’s work in establishing standards of practice is an important facet of creating a real profession of family mediation. The Board of Directors of APFM is unanimous in the belief that real certification is a key step in the road to creating a real profession. We have all seen how tough certification procedures have made respected professions out of accountants and financial planners. Standards of Practice must precede the certification process. To get the Standards to be strong, clear and generally accepted, we need to hear more from you, our members. Please keep the dialogue going. 1. See “Becoming an Excellent Mediator – When Facing Opposite Choices, It’s all a Question of Balance” by Heather Allen. Steven Abel is a founding member of the new Academy of Professional Family Mediators and is a divorce mediator and family law attorney with more than 40 years’ experience. He is the editor of Federal Family Law, one of the co-authors of The Friendly Divorce Guidebook for New York, and author of articles on divorce law (including “Social Security Retirement Benefits”), and several Blumberg law forms for divorce, including Child Support Worksheets. Steve is a past President of the New York State Council on Divorce Mediation. He is a founder of the New York State Chapter of AFCC.